Here is a list of Best Free Inventor Viewer Software for Windows. These software let you view IPT, IAM, and IDW files and analyze them using a number of 3D model viewer tools that they provide. To look around a 3D model, you will find Rotate, Spin, Zoom In, Zoom Out, Zoom to fit, Pan, and Move tools in these free Inventor viewer software. To view the structure of 3D files, these software provide options to view Wireframe of models, wireframe with hidden lines invisible/grayed out, and solid structure with/without edges. You can also view Inventor files from their top, bottom, front, back, right, and left sides. Some of these software also provide option to view cross section of Inventor files. Apart from viewing tools, the listed Inventor viewer software provide some other tools for 3D model analysis. Measurement tool is one of such tools; it lets you measure length, angles, volume, and weight of objects. You will get to know more about these free IPT viewer software as you go through the list. You will also know how to open Inventor files using these software. In the following list, you will find a dedicated Inventor viewer and 3D model viewers that support Inventor files and various other 3D drawing files. My vote goes with Autodesk Inventor View for the best Inventor Viewer Software. Its a dedicated software to view Inventor files and can open IPT, IAM, and IDW files. You can also checkout the list of best free Rhino File Viewer For Windows, Solidworks Viewer Software For Windows, and JT Viewer Software For Windows. Autodesk Inventor View is a free Inventor viewer software for Windows. Autodesk provides this IPT viewer software for free with standard 3D file viewing tools. Along with IPT, you can also view IAM and IDW inventor files here. Talking about the viewer tools, an object can be rotated, panned, zoomed, and viewed in orthographic and perspective views. Take a look at an object from top, bottom, front, back, right, and left sides of it. You can also take a look at wireframe structure, shaded structure, or solid structure of a model without edges. In case you are viewing an assembly inventor file (IAM file), you can take a look at a single part (IPT file) at a time, hide a part, or view the full assembly model. Assembly tree is displayed on the left side of the interface which enlists all the parts of an assembly inventor file. eDrawings Viewer is a free CAD viewer software where you can view Inventor files. It provides all the necessary tools required to view IPT files. You can open multiple inventor files to view them in different tabs. 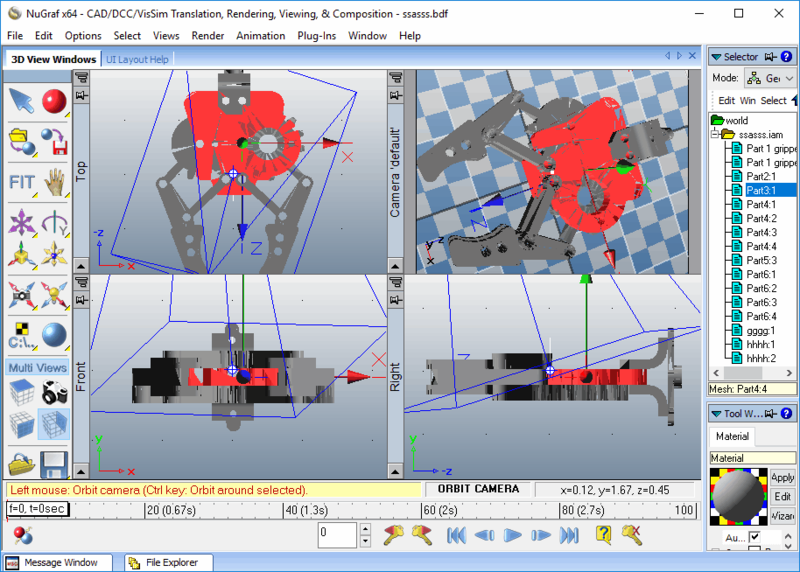 For general analysis, tools to Rotate, Zoom, and Pan 3D objects are available. You can also view an Inventor file from Top, Bottom, Front, Back, Right, Left, or can have an Isometric view. To analyze a model’s structure, this Inventor viewer lets you view its wireframe structure, solid structure, and solid structure with edges. You can also make use of the Cross Section tool, which lets you cut a 3D model into half from any desired angle. An Animate option is available here which animates the movement of a 3D model while it rotates from one viewing angle to another. It is one of the best free 3D viewers available. EnSuite-View is a feature rich Inventor viewer for Windows. This free IPT viewer provides a whole lot of features that make it a perfect 3D file viewer, but it comes with certain limitations. You have access to all the tools that this viewer provides, but you can only view 6 files per month. The paid version of this CAD viewer software comes with the same tool sets, and you can view unlimited files. Talking about the viewer tools, you can use the rotate, zoom, spin, and pan tools to look around a 3D model. View a model from top, bottom, front, back, right, and left sides. For model analysis, you can enable wireframe mode, where a 3D model’s structure can be viewed easily. The wireframe mode lets you view a model with grayed out or invisible hidden lines. Other important tools in this Inventor viewer let you view cross section of a model, measure angles, length, volume, and weight. The Cross Section tool lets you have a look at a 3D model cut in half. You can freely change the angle of cross section to view model details. NuGraph provides a free CAD viewer software that can be used as an Inventor viewer software. Along with IPT files, you can view IAM and IDW Inventor files here. The free version comes with a limitation that it does not displays every fifth polygon of a 3D file. You can use this IPT viewer if you want to have a brief look at a 3D model. Lets get to know more about the features of this free Inventor viewer software for Windows. When you open a model in this CAD viewer, it displays a model in 4 different projections in different panels. Top projection, Front projection, Right projection, and Isometric projection of a model are displayed. If you want, you can view a panel in full screen mode and use various tools to analyze the model. Use viewing tools to rotate, pan, move, zoom, and spin a model. If you are viewing an assembly Inventor file, you will be able to view all of its components listed in a folder tree available on the right side of the interface. You can hide a selected part if you want to. NuGraph is not just a 3D file viewer, but a good 3D file editor as well. To edit Inventor files, you can add various 3D objects to your model. Options to convert IPT to DWG, STL, SKP, IGES, and other 3D file formats are also available. The restriction applies while exporting IPT files as well. You can only export a model with every 5th polygon missing. I would only recommend this IPT viewer if you just want to have a quick look at 3D models.